Material Methods develops and manufactures Particle Adsorbent Composite (PAC) sheet materials for electrochemical electrodes, and gas or liquid purification. A wide variety of powders can be custom fabricated into a smooth, strong, thin, flexible sheet. The sheets can be made up to 95% working material by weight. Particles in the size range 0.01 to 100 microns are fixed by a nano structured web of inert, polymer binder. The particles are immobilized, yet accessible. Porosity can be made in the range of 50 to 90% void fraction. Sheet thickness can be manufactured in the range 50 to 1000 microns. Sheet properties that can be tailored to applications include porosity, surface area, strength, and electrical conductivity. Applications include super capacitors, fuel cells, gas separation, water filtration, and others. Recently we succeeded in binding NaX zeolite particles (1-5 micron) in a sheet form (0.25 mm thick) with only 10 wt % fibrillated polymer binder. 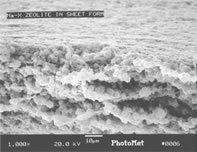 The SEM micrograph shows that the material has large porosity, which allows good access of gas to zeolite particles. The adsorption of N2 on zeolite sheets was characterized by the thermogravimetric method (University of South Carolina). We did repeated adsorption / desorption cycles of N2 at atmospheric pressure and 45 C on samples activated in situ (320 C). Under these conditions, the adsorption capacity of the sheet-formed zeolite (0.235 mmol/g) was comparable with that of commercial 0.5-0.8 mm NaX zeolite beads (0.215 mmol/g), although lower than of the raw NaX powder (0.35 mmol/g). However, the rate of nitrogen adsorption was higher for the sheet formed zeolite (0.14 mmol/g/min) than for the corresponding zeolite beads (0.10 mmol/g/min), due to better access and lower diffusion path for gas molecules in the sheet. The free standing NaX powder showed the highest adsorption rate (0.19 mmol/g/min). This sheet-formed zeolite could be used as a structured adsorbent bed, in a spiral wound configuration, for N2 – O2 separation. Improved gas access and faster nitrogen uptake warrant its suitability for rapid cycle PSA applications. We use a polymer fibril binder to form powdered materials in a self-supported, flexible sheet form. The binder content in the finished sheet is typically about 10 % wt, and the fibrillated form of the binder ensures that the binder does not obstruct access to the outer surface of powder particles. The material is flexible and can be spiral-rolled as a parallel passage contactor. We successfully demonstrated binding carbon nanoparticles (< 0.1 micron) and activated carbon fine particulates (< 50 micron) in a sheet form, which showed good mass transfer and adsorption capacity properties for CO2 adsorption. An H2 purification project is in progress with a reputed industrial gas company.